Green Groups, Air Pollution, Global Warming, Diesel, Idling Engines, Town Planning & More! Communities in the Philippines that were once riddled with trash are being recognized for their revolutionary zero waste models. By implementing a combination of effective policy advocacy, powerful grassroots organizing, and meaningful community education on ecological waste management, these communities decreased their waste in landfills, generated more jobs, and enhanced community safety. In this year’s celebration of the Zero Waste Month, these communities were the esteemed destinations of international delegates wanting to learn about innovative models. Beginning with a presidential decree in 2014, Zero Waste Month is celebrated in the Philippines every January. This year, organizers invited foreign speakers to tour the barangays, or villages, of Potrero (Malabon City) and Fort Bonifacio (Taguig City) and the City of San Fernando (Pampanga)—communities that have successfully implemented innovative zero waste policies and models. The policy adopted by these barangays was the RA 9003, a decentralization law that devolves solid waste management down to the barangay level. It mandates source segregation, segregated collection, and segregated destination of waste and the establishment of a Materials Recovery Facility (MRF) in every barangay or cluster of barangays. Implementing ecological solid waste management was no easy task, but the barangays partnered with Mother Earth Foundation (MEF) in implementing the law. With MEF training and guidance, barangays established MRFs and strictly enforced ‘no segregation, no collection’ policy. They tapped waste pickers to conduct door-to-door segregated collection from every household, and also encouraged residents to compost their biodegradable waste. These strategies combined resulted in significant reduction of garbage ending in landfills or dumpsites. In the first year of implementation, for example, Barangay Potrero diverted 80% of its solid waste from landfills through composting and recycling, resulting in daily savings of Php15,000 from hauling and tipping fees. The ecological management of solid waste also generated jobs for the waste workers. In Potrero, 65 jobs were generated, benefitting the informal waste workers who later became authorized garbage collectors or monitoring staff for the daily collection of waste. Fort Bonifacio was able to employ 23 residents as official community organizers, solid waste liaison officers, and barangay collectors. The barangay collectors, most of whom earned P50 per day as informal waste collectors before the project started, now earn a minimum monthly salary of P8,000 plus all the proceeds from the sale of recyclables divided among themselves. The project also enhanced community safety. The once unsightly streets of Potrero and Fort Bonifacio which were also sites for petty crimes, now house materials recovery facilities with mini-eco parks complete with gardens and an eco-store. “These show that for ecological waste management, local governments do not need expensive, high-tech, and harmful waste disposal technologies that adversely affect public health and the environment, destroy much needed finite resources, cost hundreds of millions of dollars, and are unsustainable and end-of-pipe solutions,” shared Sonia Mendoza, chairman of Mother Earth Foundation. Bannered by the theme, “On the Road to Zero Waste,” the eco-tour was organized by the Mother Earth Foundation (MEF) and the Global Alliance for Incinerator Alternatives (GAIA). This blog was written by Sherma Benosa, Communication Officer for GAIA Asia Pacific. The study tour started with an event organised by Zero Waste Europe and the University of the Basque Country (UPV-EHU) in Vitoria-Gasteiz on 28 November. It consisted of an international conference focused on the reduction of costs in waste management for municipalities through the optimisation of separate collection, the reduction of residual waste and the transformation of these fraction into market products. Javier Garaizar, Vice-rector of the Campus of Álava of UPV/EHU opened the conference, followed by Ainhoa Etxeandia, Director of Environment of Vitoria-Gasteiz City Council. Their interventions were followed by Joan Marc Simon, Ferran Rosa, Enzo Favoino, Marco Mattiello, Kevin Curran, Nekane Artola and Ainhoa Arrozpide. 48 participants attended the conference, among which we found civil servants, representatives from companies and environmental consultancies, policy-makers, professors and students of the university, etc. The presentations can be found here. The afternoon was used to get to know the situation regarding waste management in Vitoria-Gasteiz, thanks to the Zero Waste group Gasteiz Zero Zabor. The 29 and 30 November were devoted to the tour of good practices of waste management and circular economy. The tour allowed visiting municipalities and counties that have experienced a significant improvement in their separate collection systems. Among these experiences, the tour visited small villages like Leintz Gatzaga or Elburgo that collect and treat bio-waste in the same municipality. The participants also visited the counties of Debagoiena and Sasieta to better know about their waste collection systems (door-to-door, roadside containers with chip or mixed systems) that have made the municipalities in these counties reach 70% and 80% separate collection or more. On top of the good practices of waste management, the tour visited good practices on circular economy. In this sense, several companies were visited in sectors like gastronomy, fashion or remanufacturing. At the Restaurant Azurmendi of Eneko Atxa, with a three-Michelin-stars Basque chef, the participants learned about the philosophy of the project and visited the facilities. After this visit, an excellent meal was provided and the participants could learn about the way they manage the bio-waste at the restaurants. Gurpide Elkartea, an association working for the municipality of Larrabetzuko, manages the bio-waste of Azurmendi and of the neighbours of the municipality. In Larrabetzuko they follow the ‘Austrian system’ of composting that involves local farmers in the treatment of bio-waste in decentralised composting sites. This reduces the cost for the municipality, while allow the local farmer to obtain an extra income and have access to good quality compost. Not far from there, in Zamundio, Cristina Cendoya and Mikel Feijoo of Skunkfunk presented the philosophy of the company and the design of the collection Capsule Zero Waste. After that, the tour went to a facility of the social economy company Koopera where they sort 18,000 tn a year of clothes. In a totally different sector, the tour also visited Rebattery, a company located in Bergara that remanufactures and recovers batteries. Rebattery manages to give a new life to 60-75% of the batteries they receive and place them again in the market. The three-day study tour was not only interesting, but the living proof of the current initiatives of circular economy in the Basque Country and the potential for these activities to keep growing. The tour managed to successfully illustrate best practices through all the economic cycle. Fifteen years ago in the Philippines, trying to use your own reusable bags in any major supermarket would have entailed an argument with management and with security personnel. Zero Waste advocates like myself who insisted on using our own bags were branded as security threats, shoplifters, or weirdos. Fellow customers would rail at us for holding up the line and for wasting their time if we refused plastic bags at the checkout counter, and staff would be confused why we refused something that was free. I won those arguments most times; on days I didn’t, I simply walked away, buying nothing. Fast forward 15 years: it’s not only acceptable to use your own bags in any store in the country, but there are also laws in many cities prohibiting plastic bags and encouraging people to bring reusable bags. There is widespread public acceptance now of the idea that plastic bag use must be reduced. As someone who has been involved in the tough fight to get to this point, I know that this is a result of more than a decade of numerous protests and creative actions, countless hours of lobbying at the local and national levels to support progressive plastic policies, and a relentless public awareness campaign to bring Zero Waste messages to the public. I know for a fact that this public acceptance is spreading, and that every year more and more cities are committing to reduce the plastic menace. The very first national plastic bag ban was in fact passed in 2002 by an Asian country, Bangladesh. I also know for a fact that these successes are the result of campaigns that were waged by communities and groups, many of which are GAIA members, who have limited resources to fight head-to-head with the influential and powerful plastic industries in their countries but did anyway, and won significant battles. I also know for a fact that people living in the United States of America throw away 10 times more garbage than people living in the countryside of the Philippines, and 4 times more waste than people living in our cities. Data from Plastics Europe, an industry association, shows that European and North American countries use 5 times more plastics per person than people in Asia. So I ask whose models we should follow, and whose voices should lead. Organizing to reduce plastics had to start somewhere, so we started with the plastic bag, reasoning that as environmental awareness grew, it would be easier for the public and for governments to reduce reliance on other disposable and single-use plastics. Inspiring progress has been made: numerous plastic bag policies passed in many cities in India, Indonesia, South Korea, the Philippines, China, and Bangladesh to name a few; Taiwan’s new goal to ban microbeads by 2020, a campaign led by the Taiwan Watch Institute; and South Korea’s long-standing policy for reusable (non-disposable) utensils in fast food restaurants, due to the Korea Zero Waste Movement Network. Imagine my puzzlement and frustration then when I failed to see any of these stories mentioned in the film, A Plastic Ocean. Instead, what was captured were stereotypes often repeated elsewhere – that the global south is the source of problems and seemingly incapable of providing solutions, that it is a polluted and hopeless place, its peoples helpless and clueless, that we are endlessly waiting for salvation from the north. This is painful and upsetting, knowing the hardships of Zero Waste leaders in the region to promote environmental justice. A striking example is Dr. Shahriar Hossain from Bangladesh who received threats to his life and lived in exile from his beloved country for several years because he dared to lead the national campaign to ban plastic bags. What many in developed countries fail to understand is that, no, the south is not just a grim and hopeless place that is full of garbage and filth. It is true, a lot of the communities and organizations in the global south have very little resources, but what we lack in material wealth, we make up for in creativity and determination. We understand our problems completely and what needs to be done. We don’t need to be told—we know the true cost of pollution. After all, a huge percentage of the population in the south rely directly on natural resources—our oceans and rivers and forests—to live. It is imperative that we stop the onslaught of pollution into our lives, but we do not want to rely on false solutions, on machines and technologies such as incinerators that claim to magically make our waste disappear overnight but leave a toxic legacy of ash and air pollution for future generations. We also often have to contend with powerful industries colluding with those in government that threaten to knock us down at every turn, but we persist anyway. And more often than not, the visible waste we are struggling to address and find solutions for are products and packaging designed for advertising and maximum brand recall but cannot be recovered or recycled at all, such as multi-layer packaging and sachets. Multinational corporations — mostly based in the United States and Europe — push products that come in these packages and claim that they are “pro poor”, but in reality the economic and environmental costs of their actions are much higher and are borne by communities and local governments. These corporations wouldn’t dream of selling so many products in packaging like this in developed countries, a clear case of double standards. It is deeply unfortunate that this film and so many other mass media stories from the U.S. and Europe fail to see and show the organizing leadership of Zero Waste and environmental justice advocates in the global south and our work to create a better environment for our children, and instead only focus on what is wrong. In my personal experience as a waste activist, I’ve seen that many of the most lasting solutions are those that engage the community. It is when you take the time to think things through, adapt, involve as many stakeholders as possible, and learn, that you create solutions that will take root. After being the first (and still only!) country to protect clean air by banning incineration seventeen years ago, Filipino cities have shown that Zero Waste strategies can work and make changes fast. They employ and empower waste workers. They engage residents through door-to-door trainings and collection. They change the face of waste through community gardens and compost centers. And — last but not least — they dramatically reduce pollution into our air, waterways, and climate. Across the Asia Pacific region, zero waste advocates are working for policies that will turn off the unending flow of plastics and waste that cannot be recycled, compel and work with manufacturers and producers to redesign their products so that these do not become waste, convince the public to reduce their addiction to disposable products, and support the development and creation of industries that will make products that can be safely returned to production or to the earth. All this, while working to ensure that those relying on discards and resource recovery, those working in the informal waste sector, are not displaced and are fully involved in the solutions that must be implemented. This is the work that needs support — not expensive and failure-ridden techno-fixes that haven’t worked in the global north and only threaten to create more pollution and threats to human health and livelihoods in the south. I’m happy to be part of the #BreakFreeFromPlastic movement, and invite you to join us and lend your support to real solutions. On the July 14th, civil society organisations, schools, companies in the waste sector and public institutions met to initiate a ‘Strategy for Barcelona to go towards Zero Waste’. The main challenges of waste management in Barcelona were presented as starting point. The Fundació per a la Preveció de Residus i Consum, a Zero Waste Europe member, participates actively in the design of the new strategy. The Food Bridge project promoted by the Fundació per a la Prevenció de Residus and the Fundació Banc de Recursos intends to make an impact on food waste reduction through a campaign based on solidarity and the re-use of natural resources. This project is addressed to catering companies, restaurants and food distribution companies willing to reduce food wastage at their shops or restaurant and donate the excess food to social entities. In a year, the project has managed to re-use 1722 meals of cooked food and 656kg of fresh food that would have been otherwise wasted. Zero Waste Europe Policy Officer, Ferran Rosa covers his experience of the Zero Waste Festival in Paris. From 30th June to 2nd July the first Zero Waste Festival took place in Paris. Organised by Zero Waste France, the festival brought 5,000 participants together in a unique event where policy-makers, entrepreneurs, innovators, waste managers, individuals living a zero waste lifestyle and civil society organisations shared a forum. The Festival successfully managed to provide a holistic vision around waste, from management and institutional solutions, to consumption patterns and sustainable lifestyles. More than a congress on zero waste, it was truly a Festival, with workshops, conferences, debates, seminars and lots of space to discuss and learn from different experiences, all accompanied with an excellent atmosphere of good music and veggie food. Zero Waste France was made the case for the need to transition towards Zero Waste from many different angles including: individual consumption and waste generation patterns, municipal waste management, requirements for design, industrial responsibility, and more. In this regards, a wide range of solutions enabling a phase out of the take-make-dispose model were presented, from collective action (Capannori, Parma or San Francisco) to individual engagement to transition (Roubaix, Bea Johnson or Famille Zero Déchet). Among these solutions, Zero Waste Europe launched its latest campaign, the People’s Design Lab, a collaborative tool allowing citizens to nominate wasteful products that will eventually be, redesigned in design workshops partnering with consumers, producers and designers. On top of that, Zero Waste Europe presented the network of Zero Waste municipalities and the importance of building a network of change-makers at the European level so that municipalities can learn from each other. The attendance of 5,000 people at the Festival is testament to the success of Zero Waste France’s initiative and that there are plenty of people willing to make the transition happen in France and abroad, and that this number is indeed growing. The Festival didn’t only inspire individuals to finally live a zero waste lifestyle, but also local councillors to re-think their waste management systems and individuals to create a local Zero Waste groups. This blog is a guest post from the Zero Waste Working Group within the YOUNGO (the Youth NGO constituency under the UNFCCC). They were present in Paris during the COP21 Climate Negotiations and have committed to advocating for zero waste as a climate change solution. You can get in touch with them by contacting Zero Waste Europe, or through their Facebook group. It is argued that the “Waste” sector accounts only for a limited part of the GHG (greenhouse gases) emissions on a global level, yet it can be easily verified that the potential contribution of waste prevention and management to climate change mitigation could be much more remarkable than initially expected. In addition, considering the principles of circular economy, it is clear that resources should be continually cycling through the system, allowing us to build an exit strategy from landfills and incineration. In the light of these conclusions, a group of committed young people decided to be the voice of the Zero Waste movement at the UNFCCC climate talks by creating a Zero Waste Working Group within YOUNGO, the Youth NGO constituency under the UNFCCC, which includes youth organisations acting on climate from all over the world. The YOUNGO Zero Waste working group was born at COP21 in Paris, and it is composed of young people living in three continents (Europe, America, Oceania) who share the same drive for spreading the good practices for a zero waste world. The purpose of our group is to create a global network of young people who believe that Zero Waste is not only possible, but necessary. Therefore, we are looking to spread this message and simultaneously working on projects, policy and research that lead us towards a Zero Waste planet. Furthermore, we want to act as a platform where young people can share knowledge and expertise on the connection between climate change and waste management and how it can be used as a mitigation tool in accordance with the outcome of the Paris Agreement. In fact, our work is mainly focused on individual countries (possibly through INDCs, industry and government lobbying) and Delegates. We want to highlight the positive correlation between Zero Waste and the emissions reduction through waste minimisation, making it really tangible. Currently, we are working on diverse strategies, and the support of Zero Waste Europe, as well as of GAIA, would be an asset for us. We have the potential to build up a wide youth network in all of these regards, working on actionable and unifying initiatives. Our first next steps will be to search through INDCs for specific mentions of waste/Zero Waste as climate change mitigation tool to create a list of countries who are moving forward on this issue. Moreover, a table divided into different categories will be created (Zero Waste as most preferred – waste-to-energy/landfill as least preferred) with a sort of rank for countries. The final idea would be to approach these countries at COP22 in Marrakech (Morocco) or at intercessionals accordingly to their “performance”. Another point is the running of campaigns that may include some focus on incineration and cradle-to-cradle ideas. We will also continue to use the YOUNGO Zero Waste Facebook group to keep ourselves posted as we nail down our plans and to share information. Lastly, it is utmost important proposing to the UN to make conferences like COP zero waste – perhaps through lobbying activities with either the Secretariat or the COP22 Moroccan Presidency; it is noteworthy, however, that efforts in this direction have already been made previously for the organisation of the COP21 in Paris and at the last intersessional in Bonn which both incorporated zero waste aspects into their events (APA1/SB44). There will be space to get in direct contact with the COY12 (Conference of Youth, 12th edition) organisers to probe their willingness in this regard, as we will be likely to attend in mid-July the Mediterranean Youth Climate Forum in Tangier, Morocco. Making the COY12 a zero waste event will give continuity to what has been done in Paris for the COY11, which was the first COY to adopt a zero waste plan, with the collaboration of Zero Waste France. In conclusion, the Zero Waste working group is eager to increase its network within the climate and waste community, trying to create new avenues that would not have otherwise accomplished. We welcome any contribution and would be keen to set up collaborations with other associations or simply individuals who share this common cause with the same drive and motivation. You know where to find us and we are looking forward to hearing from all of you! Wong Kam Shing – GOLD BAUHINIA STAR, awarded for ……what ? Waste management in Majorca has been for long associated with the incineration of waste. With the biggest waste-to-energy incineration plant in Southern Europe, the system has been shaped and impacted by this mega-infrastructure: with average separate collection at 15% and having reached the point of importing waste from Ireland and Italy to feed the facility. However, after a change of government on the island, the region and most of the cities, a new and more environmentally friendly model of waste management is starting to take shape. Fortunately waste is no longer imported to be burned and cities, towns and villages of the island are starting to wake up and transition towards a new model. Among the discussions for this new model, the city of Palma (the capital of the island with 400,000 inhabitants) chose the World Environment Day to organise a conference on waste management to learn about good practices that will help them designing a new model for the city. The conference presented good examples of waste management on the island, with the prominent cases of Porreres or Artà, that have recently joined the limited but growing group of towns above 70% separate collection on the island and are introducing an ambitious pay-as-you-throw scheme. In addition to this, the conference focused on the role of economic incentives to help improve waste management, with examples like the bonus/malus tax on waste disposal existing in Catalonia, or the inclusion of pay-as-you-throw schemes in the tourist sector. The conference was closed by Zero Waste Europe who presented their holistic vision of waste management and to provide good examples from the Network of Zero Waste Cities and from zero waste entrepreneurs. These examples were complemented with specific advice on how to bring Palma closer to Zero Waste. The city representatives took note of these proposals, and advanced the introduction of compulsory bio-waste collection and door-to-door collection for some neighbourhoods, along with work on waste prevention. All in all, the conference showed that there are alternatives to traditional waste management and that even for an island with the largest incineration plant, it is possible to start shifting. On the 22nd June, 2016, Zero Waste Europe held the closing conference of the project “Town to town, people to people – Building a European Culture of Zero Waste” in Brussels. The project aimed at bringing together European municipalities and environmental organisations in the construction of a new zero waste culture. After the Budapest, Ljubljana and Capannori conferences in November April and May, the final one took place in Brussels on 22nd June. Besides identifying good practices at the local level and helping diffuse them across Europe, this last conference also intended to bring the conclusions of the project to European policy makers. The conference served to present Zero Waste Europe’s latest case study on the city of Parma. Gabriele Folli, Environment Councillor from the city of Parma, presented their transition towards Zero Waste, explaining how they have managed to move from 45% recycling to 73% in only 4 years and notably reduced their residual waste by 59%. The city is the vivid example that ambitious targets for the circular economy aren’t only feasible but bring environmental, social and economic benefits. In addition to the presentation from Parma, the closing conference of the project counted on the presence of Annemie Andries, Senior Policy Advisor of OVAM, the Flemish Agency of Waste, who presented the new targets on residual waste that are being envisaged in Flanders. These accompany recycling targets and other measures and aim at pushing for a reduction of the non-reusable and non-recyclable waste. After her, Alexandre Garcin, Deputy Mayor of Roubaix, presented the transition towards Zero Waste of this city in the North of France. In their case, the city doesn’t have the power to implement separate collection, but is directly working with households, companies, schools and civil society to minimise waste generation and to ensure separate collection of the waste that is produced. Roubaix showed that political will can overcome legal constraints. Finally, Caroline van der Steen, Director of Stadsecoloog of Bruges, presented their Food Smart City project and the work they are doing to prevent food waste and to find alternative and innovative ways of making the most of food surpluses. The project and the conference has allowed cities and civil society to exchange good practices on waste prevention, separate collection and other sectorial specific measures. Besides, it has boosted the exchanges and the relations among cities across the EU, truly permitting to build a culture of zero waste that has lead even to the twinning of two cities thanks to their efforts to go zero waste. Zero Waste Europe (ZWE) has published today a new case study on the city of Parma, Italy, which highlights how with political will and citizen involvement it is possible to radically reduce residual waste, create jobs and save the taxpayers money. Parma, with 190,284 inhabitants, had separate collection stagnated around 45% for some years. However a citizens-led initiative to move away from waste disposal managed in 2012 to transform waste policies and brought a zero waste plan for Parma. The new plan copied and improved what is already working well in other towns of the zero waste network; intensive kerbside collection and pay-as-you-throw systems together with lots of education and keeping the system flexible to accomodate further improvements. The indicator that the town used to measure success was the reduction of residual waste (what is sent for landfilling and/or WtE incineration) per capita which was reduced by a staggering 59%, from 283kg to 117kg, in only 4 years. By 2015 the separate collection was raised to 72% and the quality of the materials separated for recycling had also increased. 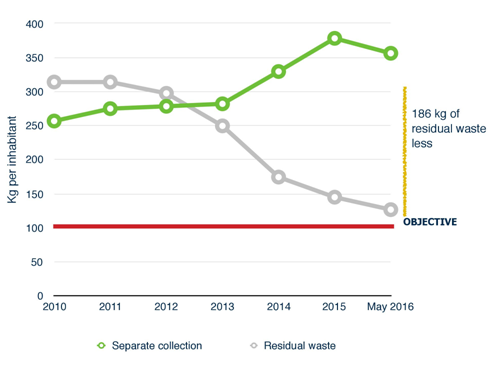 The new system of collection is more labour intensive which has meant that the number of waste collectors has increased from 77 to 121 with a number of other indirect jobs being created whilst the city has saved €453,736 in comparison with the former system. But the transition is far from over. 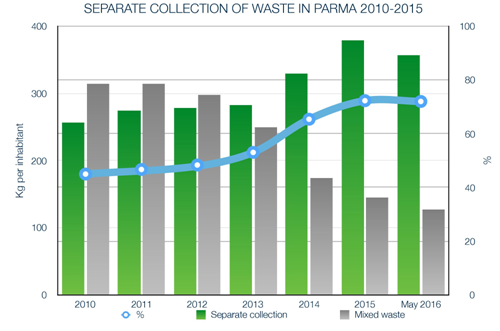 By end of 2016 Parma will be generating less than 100kg of residual waste per person and have achieved 80% separate collection and plans are to continue on the path to zero waste. Joan Marc Simon, Director of ZWE said “Some spend their time finding excuses not to deliver in 2030, others like the city of Parma prove that a target of 70% recycling and 100kg residual waste per capita is achievable in less than 5 years”. This case study and the case for a target on residual waste per capita will be presented in Brussels next Wednesday 22nd June by the Councilor for Environment of the city of Parma, Gabriele Folli, in the conference Towards Zero Waste Cities: How local authorities can apply waste prevention policies taking place at the Committee of the Regions. How good are ecigarettes at helping smokers quit? Cruise ships: a paradise of fun or floating killing machine?